Nashville is reveling in its newfound status as “It City,” attracting millions annually to take advantage of its music, art and culinary scene. Tourists plan “eat-ineraries” to visit Music City’s most popular restaurants and sample the iconic hot chicken that will burn the taste buds off your tongue. When it comes to craft beer, Nashville was relatively late to the party, known for decades as a bastion of mega-brewery products served in plastic cups in the rowdy honky tonks of Lower Broad, with only a smattering of brewpubs offering anything more interesting than a light lager. But that’s changed. In recent years, more than 20 breweries have sprung up around town, making “Brewsic City” a worthwhile destination for beer fans. 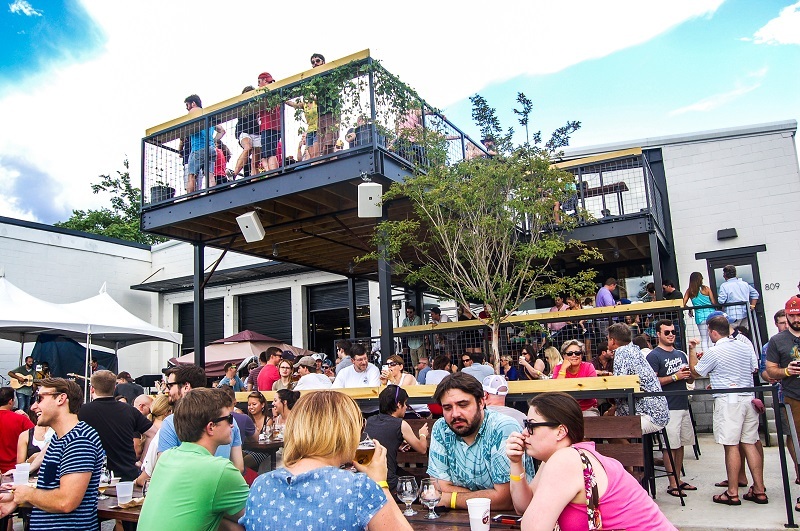 Here’s a plan for visiting some of Nashville’s best breweries and taprooms, while dodging the more touristy sections of downtown. Start out west of downtown in The Nations, a formerly industrial part of town now reborn as a hip neighborhood. Blackstone Brewing Co. (2312 Clifton Ave.) is the oldest brewery in Nashville, and its St. Charles Porter is a fine example of the style, earning more awards than any other in the Great American Beer Festival’s brown porter category. The no-frills taproom is adjacent to the brewhouse, offering a view of the process while you enjoy a pint or two. The newest brewery in The Nations is Fat Bottom Brewing (800 44th Ave. N.). Try Ruby, an American red ale, while partaking of a menu of elevated bar snacks and sandwiches in Fat Bottoms Hop Yard Restaurant and Bier Garden. While you’re in the neighborhood, head next door to SPEAKeasy Spirits (900 44th Ave. N.) where Pennington Distilling Co. produces Pickers Vodka, Whisper Creek Tennessee Sipping Cream, Davidson Reserve Rye and other spirits. The distillery offers tours and is in the process of remodeling its property to include multiple tasting rooms, bars and a retail bottle shop. Head toward downtown to find an even greater density of breweries, perhaps stopping for a beer and a slice of pizza at TailGate Beer (1538 Demonbreun St.) at the top of Music Row. TailGate’s downtown taproom sells dozens of varieties of beer brewed at their large production brewery on the outskirts of town on a 50-barrel brewhouse (the city’s largest). Many of these beers feature exotic flavors like Watermelon Wheat and Peanut Butter Stout that are especially popular with what locals call “woo girls,” those bridal parties who steel themselves with some liquid courage before boarding pedal taverns for boozy tours of downtown. 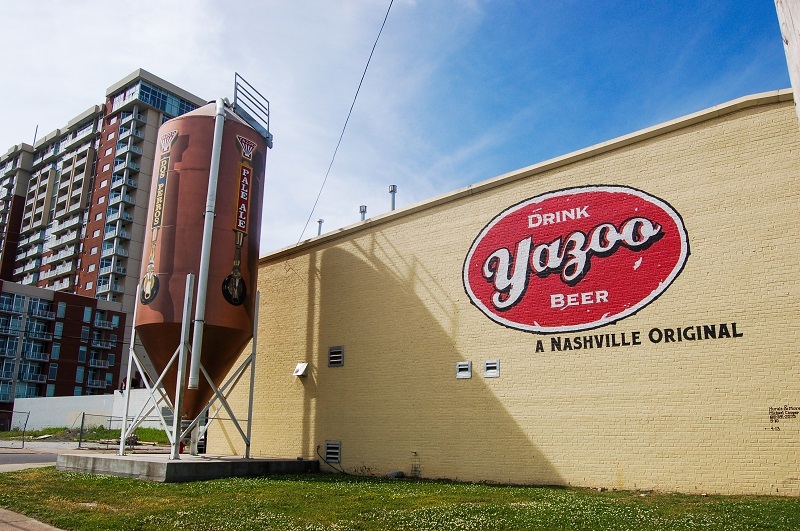 Prime among the five is Yazoo Brewing Co. (910 Division St.), the game-changer of Nashville’s craft brew industry. The first brewery in town to gain regional acclaim, Yazoo sells a wide range of popular beers, from its Dos Perros Brown Ale to its signature Pale Ale. The brewery is also known for a series of sour beers under their “Embrace the Funk” label. Ephemeral and difficult to find, the these beers are probably easiest to sample in Yazoo’s inviting taproom. Just around the corner is Jackalope Brewing Co. (701 8th Ave. S.), Nashville’s only female-owned brewery. The founder admits she actually thought the legendary rabbit/antelope hybrid that gives the brewery its name was a real animal until embarrassingly late in life, but her brewery runs with the joke by naming its beers after mythical creatures. New Heights Brewing (928 5th Ave. S.) is the newest addition to the Brewery District in a building near the former site of Gerst Brewing, the Bavarian-style brewery that dominated the beer scene in town for much of the 19th century. Every night save for Tuesday, New Heights invites visitors into its cozy taproom or onto its outdoor patio. Beer selections rotate frequently and range from intensely hoppy IPAs to creamy ales. If Bearded Recluse Imperial Brown Ale is on tap, do yourself a favor and ask them to pull you a pint. Czann’s (505 Lea Ave.) is a modest little brewery in a nondescript industrial building in SoBro (South of Broadway), but that doesn’t mean there aren’t great things going on inside. Emphasizing balanced beers, Czann’s offers a crisp IPA and a light, dry blond that have earned them legions of fans. Beer finds its way into glasses and on plates at Tennessee Brew Works (809 Ewing Ave.). Its burger, one of the city’s best, is adorned with Country Roots Stout-braised onions and Cutaway IPA pickles, Basil Ryeman ketchup and a comeback sauce made with Southern Wit, all sandwiched between buns baked with Extra Easy ESB. 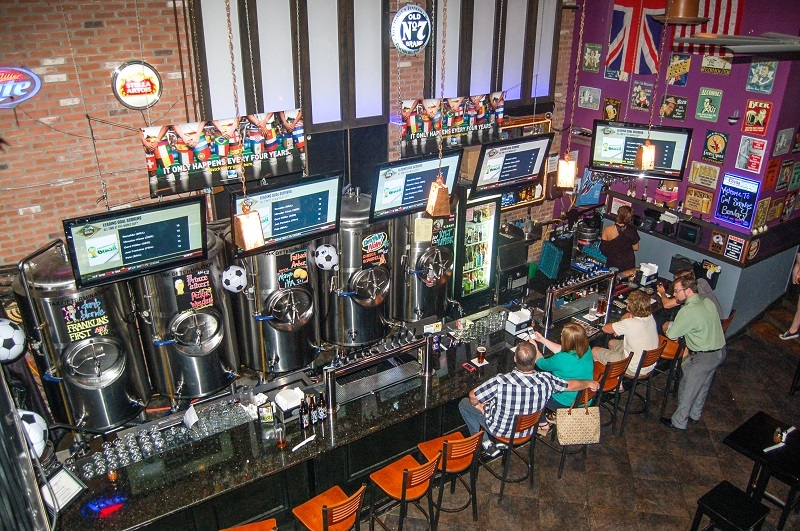 The multi-level taproom offers views of the brewery operation and downtown, plus live music on most nights. While Friday allowed for lots of walking between stops, you’ll need transportation today for an odyssey of breweries outside of Nashville’s main core. Start your journey with a trip south of town to the area around Franklin, a historical suburb with charming neighborhoods and attractive shops. But first, hit the mall at Cool Springs Brewery (600A Frazier Dr.) a microbrewery and restaurant run by a couple of British expatriates. Their heritage ensures you can score a proper order of fish & chips that rivals those at an authentic English “chippy,” or fine pizza and chicken wings to prepare for a day of tasting. Cool Springs also brews some innovative beers in a cramped system tucked behind the bar, and it’s remarkable to see the variety they pump out of those tanks. Franklin’s First Kölsch is an homage to the fact that they were the first legal brewing operation in the city, and it pairs nicely with an order of those fried cod fillets and some malt vinegar. Former Cool Springs employees opened Mantra Artisan Ales (216 Noah Dr. #140) where they work with exotic yeast strains and focus on exotic recipes. Some are only available in the taproom, while others see broad distribution (including Japa Milk Chai Stout, a Flanders Red named Amour Rouge and the popular Saffron IPA, which is an exceptional accompaniment to Indian cuisine). One of the owners of Mantra is Maneet Chauhan, a celebrity chef and the proprietor of Chauhan Ale and Masala House (123 12th Ave. N.). 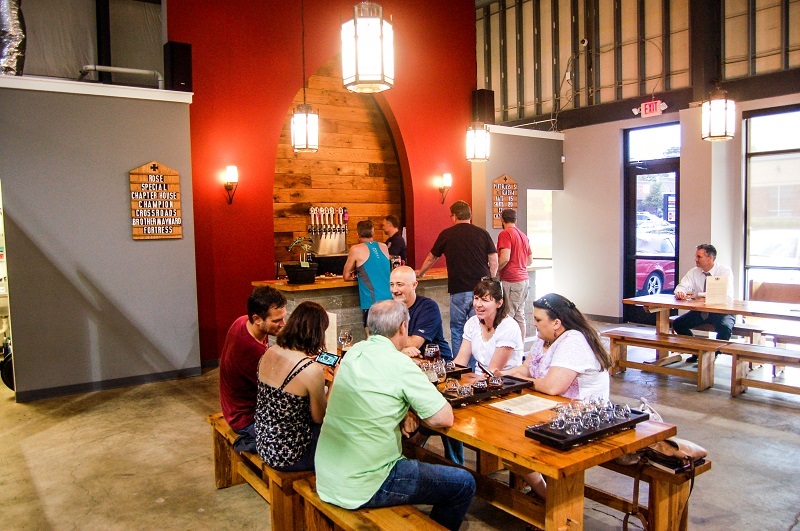 Heading back toward Nashville, stop by Black Abbey Brewing Company (2952 Sidco Dr.) a monastery-inspired brewery with a convivial taproom nicknamed the “Fellowship Hall.” Concentrating on approachable Belgian-style ales, Black Abbey has developed several local cult favorites. The 44 is an Obama-inspired porter that they joke is “liberally infused with Kenyan and Hawaiian coffee that has a little smokiness that just won’t quit.” The brewery’s largest tanks are almost always filled with The Rose, a Belgian blond with tropical aromas and a satisfying dry finish. Continuing south, try out two great spots that offer a broad menu of beers to sample. The name of M.L. Rose Craft Beer and Burgers (2535 8th Ave. S. #107) says it all. They offer a Burger of the Month that is usually paired with a specific beer. Just down the street is Craft Brewed (2502 8th Ave. S.) one of the city’s most popular growler and bottle shops. Crossing the Cumberland River into hip East Nashville (think Brooklyn with a Southern accent), you’ll have to search a little to find Little Harpeth Brewing (30 Oldham St.) In an industrial development north of Nissan Stadium where the Tennessee Titans play, Little Harpeth brews lagers almost exclusively, a throwback to the city’s pre-prohibition history and preferences dating back to the days of Gerst. A local favorite is Chicken Scratch, an American pilsner made with locally-grown corn. Also popular is the dark and malty High Water Dunkel Lager, bitter and chocolaty and sure to please. Travel up Main Street to find a newer East Nashville spot, Smith & Lentz Brewing (903 Main St.). Smith & Lentz opened on this busy artery and immediately attracted visitors with experimental brews, particularly a focus on IPAs with a smattering of German and Austrian styles sprinkled in for good measure. If you still have any room and need a few small bites to absorb some of the day’s fun, try Butcher & Bee (902 Main St.) for New American and Israeli-inspired small plates. The atmosphere is always buzzing at this modern eatery, thanks in large part to its extensive craft cocktail and beer program. The variety of the menu dovetails nicely with the breadth of brewery options to be found in Nashville, and should send you home with a full stomach and heart. Top two breweries in Nashville are Bearded Iris and Southern Grist…neither even mentioned here? ?